The Swope, Rodante Vanguard Award was established in 2011 with a mission to celebrate outstanding high school student athletes and coaches throughout all of Hillsborough County. 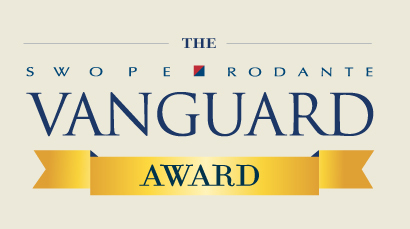 The Swope, Rodante Vanguard Award honors the hard-work, drive and discipline necessary for student athletes to make an impact both in athletics and within the classroom. These students provide a strong example for fellow peers and positively impact the school system as a whole. Each month of the school year, The Swope, Rodante Vanguard Award Selection Board, comprised of Tampa Bay business leaders and education professionals, recognizes a “Student Athlete of the Month.” The winning student receives an award recognizing his/her achievements and a $1,000 check that is donated to their school’s athletic department in honor of their outstanding performance. Student Athletes of the Month are also eligible to be named the overall “Student Athlete MVP” at the end of the year and receive a special gift to use for college. The Swope, Rodante Vanguard Award also recognizes outstanding coaches. At the end of each school year, two coaches – one male and one female coach –are recognized for their remarkable contributions, both on and off the field. Each Coach of the Year is presented with $1,000 as a way of thanking them for their commitment to making a positive impact in the community.